Are you looking to have one last adventure before school starts and you and the kids go back to your usual routine? Whether you’re road tripping it or flying some place far away, it can sometimes feel a little overwhelming to have to deal with dietary restrictions when you’re away from home. To help lend you some peace of mind–here are four tips you can use when traveling sans gluten. Feel free to add some of your own suggestions in the comment section below! 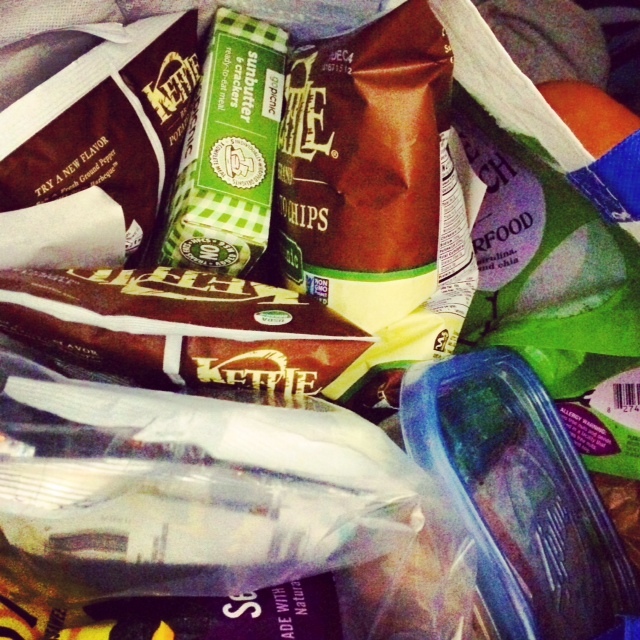 On my recent trip to Raleigh, NC, this is what I had in my bag: Kettle chips, GoPicnic box, Glutino cookies, sandwiches from home, kale chips, seaweed snax, and Udi’s Gluten Free bars. 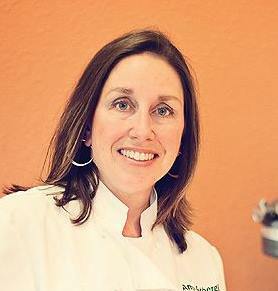 What do you travel with for a gluten-free trip? 1. Use a gluten-free app. There are dozens of free apps well-suited to the gluten-free traveler. For example, Find Me Gluten Free (available on android and iphone smartphones as well as your computer) provides a wealth of information pertaining to gluten-free dining. Here you can run a search for gluten-free friendly restaurants at your destination or simply use the GPS tracking option to find the closest restaurants to you when you’re on the road. Each of the listings provides directions, contact info and a list of reviews from other gluten-free individuals who have already scoped out the restaurants you’re considering. The app also provides a list of gluten-free products you can find in many grocery stores as well as a list of ingredients you can click on to learn whether they are gluten-free. Android even offers The Gluten-Free Scanner app which lets you determine whether a product is gluten-free with the simple scan of a bar code. The app isn’t always 100 percent accurate so do use some common sense before you consume! You’ll often be pleasantly surprised by the gluten-free items you can find while traveling. 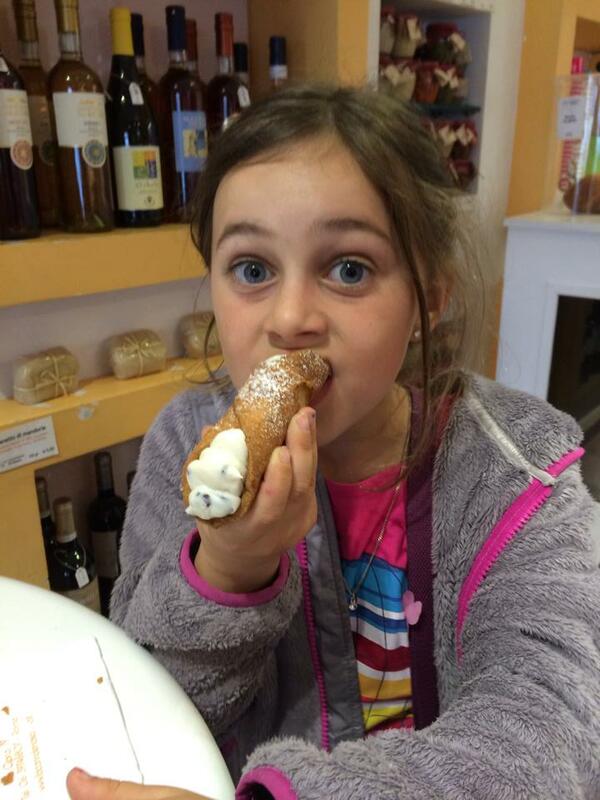 Here is a gluten-free cannoli we found in Rome, Italy. 2. The grocery store is your friend. Whether you’re traveling in California or Alabama you’d be surprised just how many gluten-free options are now available in the local grocery stores. When I was in New York two years ago I saw many of the same gluten-free brands I’ve grown accustomed to at home in the San Francisco Bay Area. You still have to pay more for the gluten-free products, but the good news is that gluten-free is gaining ground no matter where you go. 3. Bring your own snacks. If you don’t want to rely on having to stop at a grocery store, then stock up on your gluten-free favorites before embarking on your trip. Bring a cooler and load it up with your own sandwiches made from Canyon Bakehouse gluten-free bread (our personal favorite) or stock up on some other great snacks such as Glutino pretzels or tortilla chips from Way Better Snacks. Just remember if your flying, not to carry more than 3.4 ounces of any liquid on the plane. And yes, peanut butter counts as a liquid! Individual packets are fine but you won’t be able to bring a jar in your carry-on. 4. Use Google with a grain of salt. By all means, research the nearby restaurants at your destination before embarking on your trip. However, don’t let one or two bad reviews scare you off of a place entirely. Sometimes a restaurant may have just had a bad night or have since vastly improved their service and offerings. Keep the dates in mind when reading the reviews and don’t be afraid to speak with the management about any of your concerns. In my experience, most restaurant staff have been very accommodating when I’ve initiated a conversation about my family’s dietary needs. How Much Does Shortening Weigh?